This originally appeared on the aomin blog, 03/20/2010. "How do you know that the Holy Scripture is all you need? What tells you that? Might you need a God-led authority (like the Roman Catholic Church) to tell you that?" This was a question I recently came across from the depths of cyberspace. It's a question sharply aimed against sola scriptura, but it's a false question attacking an incorrect understanding of sola scriptura. Underlying this question is the assumption that the Sacred Scriptures are not enough to function as the sole rule of faith for the church. There must be something else a believer needs, like an infallible magisterium. One part of this question is indeed true: if God's voice of special revelation is found somewhere else besides the Bible, Christians are obligated to seek out that voice, and follow it with their entire heart, soul, mind, and strength. Protestants though argue the only extant record of God's infallible voice of special revelation is found in Sacred Scripture. The burden of proof then lies on those who claim God's infallible voice is somewhere else besides the Scriptures. If God's infallible voice is extant today somewhere else, sola scriptura is refuted. If God's voice is found in an infallible magisterium or unwritten traditions, sola scriptura is refuted. If our debate this evening was that I was going to stand here and say that this is the only pen of its kind in all the universe, how would I go about proving it? Well, the only way I could prove the statement "there is no other pen like this in all the universe," is if I looked in all of your purses, and all of your shirt pockets, and in all the stores in the world that carry pens, and look through all the houses, and all over the planet Earth, and the Moon, and the planets in the Solar System, and in the entire universe, looking for another pen like this. And, of course, I could not do that. But it would be very easy for Mr. Madrid to win that debate. All he needs to do is go out, get a Cross Medallist pen, walk up here, hold it right next to mine, and say, "See! Another pen, just like yours!" and he's won the debate. In light of this, I would assert that Mr. Madrid must either recognize this reality, and not attempt to win this debate by doing nothing more than depending upon an illogical demand; or, he must demonstrate the existence of "the other pen." That is, he must prove to us what the Council of Trent said was true. I quote, "It also clearly perceives that these truths and rules are contained in the written books and in the unwritten traditions, which, received by the Apostles from the mouth of Christ Himself, or from the Apostles themselves, the Holy Ghost dictating, have come down to us, transmitted as it were, from hand to hand." An argument like this is pointed directly at what Romanism claims to have: God's voice elsewhere besides the Sacred Scriptures. Most often those defending Romanism claim to have God's voice in Sacred Tradition. Getting them to throw this Tradition up on the table to take a look at is the problem. Typically only one thing is thrown up on the table as Sacred Tradition, the canon of Sacred Scripture. The canon is said to be an example of God's voice of special revelation outside the Bible. The first problem with this argument is that it goes to battle alone. If I quote a verse from the Bible, I can also have that verse joined by the entire text from which the verse is found. When someone uses the canon as an example of God's voice in Sacred Tradition, the entire contents of Sacred Tradition still hides back up in the hills. Roman Catholics can't produce what they claim to have. They aren't even unified as to whether Sacred Tradition is simply the same material as found in the Bible, or if it's information of another kind. One bucket of water in a desert is not proof that a large lake is just over the mountain. The second problem is a misunderstanding by Roman Catholics as to what the canon list is. The canon list is not revelation, it's an artifact of revelation. It is Scripture which Christians believe inspired, not a knowledge of the canon which is inspired. The church has discovered which books are canon, they haven't infallibly determined them to be canon. For a detailed explanation of this, track down a copy of Dr. White's book, Scripture Alone, chapter five. Third, Roman Catholics have often jumped on R.C. Sproul's statement that the canon is a fallible collection of infallible books. The statement itself originates from Sproul's mentor, John Gerstner. This statement is not an admission that there is an error in the canon. It is a statement simply designed to acknowledge the historical selection process the church used in discovering the canon. By God's providence, God's people have always identified His Word, and they didn't need to be infallible to do so. Remember that large set of books in your Bible before the Gospel of Matthew? The church had the Old Testament, and believers during the period in which the Old Testament was written also had God's inscripturated word, this despite a lack of magisterial infallibility. Fourth, there is no reason to assume church infallibility in order for the church to receive the canon. That is, there is no reason to assume God's voice of infallible pronouncement via an infallible magisterium. I recognize the Christian church received the canon. It does not though infallibly create the canon, or stand above the canon. The church was used by God to provide a widespread knowledge of the canon. The Holy Spirit had worked among the early Christian church in providing them with the books of the New Testament. This same process can be seen with the Old Testament and Old Testament believers. The Old Testament believer fifty years before Christ was born had a canon of Scripture, this despite the ruling from an infallible authority. First century Christians had the Old Testament, and had "certainty" that it was the very word of almighty. Clement of Rome frequently quotes the Old Testament. He does so, with the understanding that the words of the Old Testament are the very words of God. He was certain of it, this despite not having the alleged infallible ruling of an infallible authority. His use of Old Testament passages show a certainty that the words were God's words. Or, think of Paul's exhortation to Timothy. Paul notes that from infancy Timothy "knew" the Holy Scriptures (2 Tim 3:15): "and how from infancy you have known the holy Scriptures, which are able to make you wise for salvation through faith in Christ Jesus." How was it Timothy could know the Scriptures were the words of God without an infallible church council declaring which books were canonical? Obviously, the notion that an infallible authority can only provide canon certainty cannot be an accurate explanation of Christian reality. Think of all the New Testament writers. They freely quote the Old Testament with the certainty that it was the Word of God. Yet, no infallible source defined the canon for them. A "source" definitely received the Old Testament canon, but that "source" was not infallible, nor do I recall Rome arguing that the Jewish Old Testament leadership was infallible. There is no logical reason why the entirety of the Bible needs an infallible authority to declare the canon. It wasn't needed previous to Trent, Damasus, or the pre-Christ Jewish authority. How was it that Timothy had "certainty" the Old Testament was the word of God? It is God's sovereign power that reveals the canon to His church, for His purposes. The people of God are indwelt with the Holy Spirit. It is they, who are given spiritual life and continually fed by its words. Jesus did this himself, as recorded in Luke 24:45, "Then He opened their minds so they could understand the Scriptures." As to how a Protestant can have certainty on the canon, my certainty is in the providence and work of God. Only faith will read the Bible and hear the voice of God. God used means in giving us His canon, but like the Old Testament believers, those means don't need to be infallible for one to know they are reading and hearing God's word. 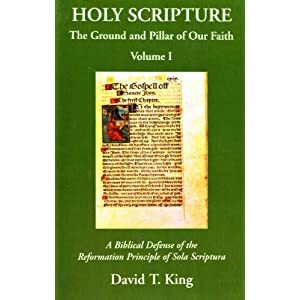 If sola scriptura isn't sola, this certainly isn't proven by Roman Catholic claims or argumentation. If Roman Catholic have God's voice somewhere else other than the Scriptures, they need to prove it. Till then, I'll stick with that which is God breathed and which can thoroughly equip a believer (2 Tim. 3:16). I'll stick with that which is "useful for teaching, rebuking, correcting and training in righteousness, so that the man of God may be thoroughly equipped for every good work."